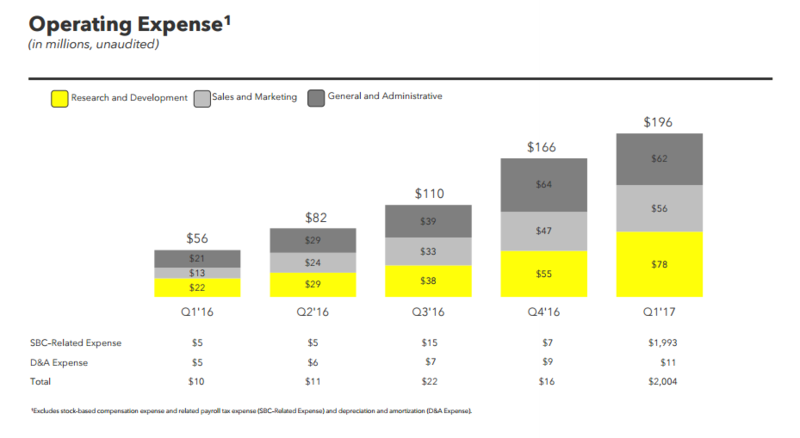 Snap Inc., the parent company of Snapchat - has just released its first earnings report as a public company. And the results are as bad as many had expected. First off on users - Snapchat now has 166 million daily active users, adding just eight million in the last three months. That's a significant slow down in the app's growth rate - for comparison, Twitter, which has long been under pressure due to their slowing growth (and has been around for a lot longer than Snapchat), added nine million users in the last quarter. Instagram - now Snapchat's biggest rival - added 100 million new users in the past four months (Instagram Stories alone added 50m daily active users in the last three months). While Snapchat has tried to temper the concerns by attaching an engagement metric to their chart (3b daily Snaps), growth is a key concern for the market. And it responded accordingly. 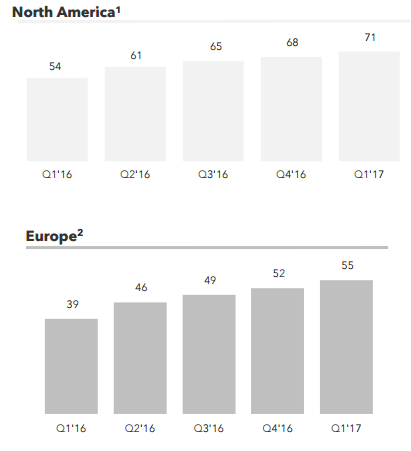 As expected, Snapchat also saw limited growth outside the US, which is where Facebook's been working to curb and restrict the app's growth (by introducing Snapchat-like options in areas Snapchat itself has little to no presence). 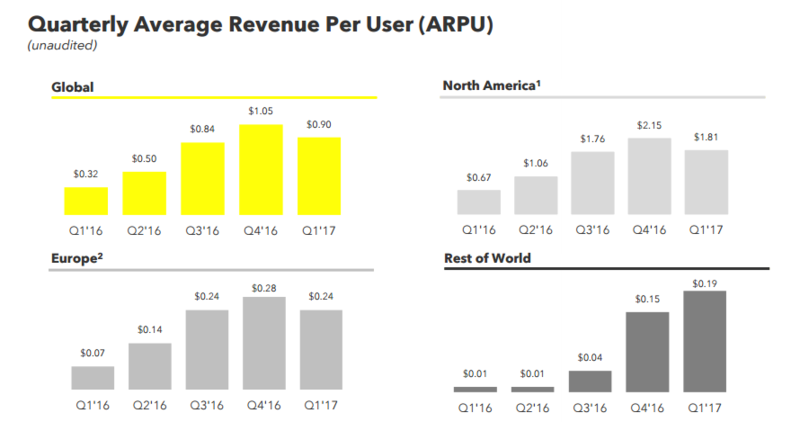 In their core market - North America - Snapchat added only added three million new users, and another three million in Europe. 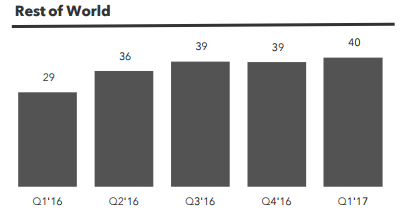 But the most important chart here could be the 'Rest of the world' graph, where Snapchat growth is virtually non-existent. 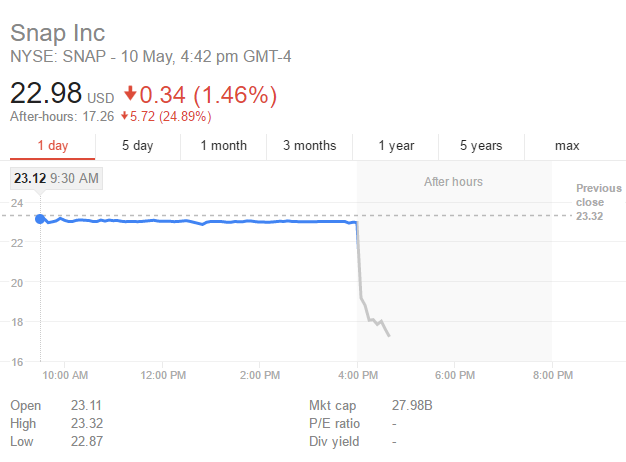 That's a bad sign for a company supposedly on the rise - and if Facebook can successfully target these regions, they could freeze Snapchat out entirely, limiting future expansion, and making growth the driving storyline of the stock, as it is with Twitter. Of course, Snap Inc. would prefer to focus on engagement - in their accompanying earnings call, Chief Strategy Officer Imran Khan noted that users are now active in Snapchat for over 30 minutes per day, which is up from the '25 to 30 minutes' stat it listed in its IPO documentation. So that's good right? More people are more active in the app more often, which theoretically means Snap has more opportunity to monetize their audience. Snapchat's advertising push has really only just begun, so this is not definitively bad. But still, it not good either. What's more, Snap Inc. has also seen a significant increase in expenditure, with a notable jump in research and development costs. That actually could be a good thing long-term - maybe they're putting more into the development of Spectacles 2.0, which still has the potential to be a much more significant element - and one outside the path of Facebook (at least for now). But when you also add in the fact that CEO Evan Spiegel is getting a $750 million bonus for taking the company public, it's not a good overall look. Various analysts have expressed as much on Twitter. From a social media marketing standpoint, a lot of this is not hugely relevant, at least not right now. Investor pressure will, if anything, motivate Snapchat to innovate faster and add more ad products and tools, which could prove beneficial. But then again, it could also accelerate mis-steps and reduce engagement - and if you're looking to reach the biggest audience, Instagram is already looking like a much better bet. But then again, as Snap notes, their engagement rates are high, and they are still growing, even at a slower pace - the platform is still a key consideration for anyone trying to reach younger demographics, and those users highly engaged on Snapchat, there's still a lot to like about the platform, and a lot of opportunity for marketers. But Snap Inc.'s long-standing anti-advertising, user-centric approach may be coming back to haunt them as a listed entity. What's good for their audience may not be good for investors - and what's good for investors will now be a much more influential factor in future decisions. So what can Snap Inc. do to re-ignite growth? As noted, Spectacles may be an option - reports have speculated that Snapchat has been trying to develop a new AR-enabled version of Spectacles, which, given the popularity of the first iteration, could be a good option. But then again, Facebook CEO Mark Zuckerberg says AR enabled glasses are still five to seven years off, and that's with Facebook's resources behind it, meaning it could be a tough challenge for Snap Inc. It does seem that this was the original intention for Spectacles, with the addition of World Lenses being a notable signal. Maybe that's a possibility. Aside from that, Snap Inc. also recently announced new tools for Snapchat, including an innovative 'Magic Eraser' option, while they also opened their self-serve ad platform, which will enable more businesses to utilize their ad options, and you can expect more in this front, particularly as they move more into hosting exclusive TV-like content. But the challenge from Facebook looms large right now, and could do for some time, especially with Facebook opening up their Camera Effects Platform, giving creators the opportunity to build innovative new visual products for the platform (as opposed to having to rely on the innovation of their own engineering team). Snapchat, it's worth noting, is absolutely about more than just Lenses and Geofilters, but when you consider that more than a third of Snapchat's daily active user base engages with Lenses every day, and creative tools like Geofilters are added to 60% of all Snaps sent, you can't argue that they form an essential part of the Snapchat experience. If Facebook can offer newer, better tools on this front - consistently - that's a big problem for Snap Inc.
On one hand, it's still relatively early days for Snapchat (particularly in an advertising sense), but on the other, early days is when growth should be strongest. There are clear concerns, but there are also opportunities, and it's still possible that Snap Inc. will be able to show renewed strength through innovation, as they've done various times before. But not a great first earnings call from Snap Inc.
Will Faceboook look to make it worse by releasing updated Instagram engagement stats this week?